Hi, this may be a silly question but is there a way to limit which keys on the keyboard will terminate an event. I was hoping that only one of the specified criterion responses (A or B) would end the trial. Have I missed something basic? Setting a correct key only response also allows any key to terminate the trial. I'm using version 2.0 on Win XP. 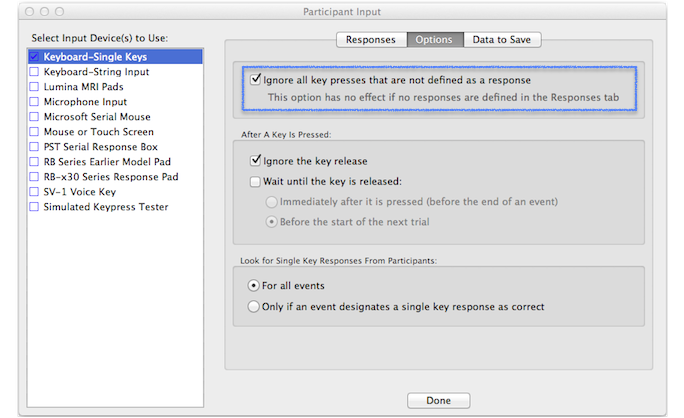 The event should end on only keys A or B if you change the event ending response to "Correct key". Hi Hisham, that's what I thought also. However, setting the correct key still allows any input to end the event. I've checked I've not allowed any other responses (such as some kind of wild card response) but it seems that any input is acceptable. I'm a bit baffled as to what to try next. However, now that you've sort of confirmed my original thoughts I'll investigate this avenue further. Did you also set the Correct Response to your "AB" response? If it's set to "(None)", then any key would be considered correct. Yes, I checked that. I'm going to set-up a new version from scratch and see if the problem remains. One of the reasons I wanted to avoid the correct response *only* setting for termination was that I wanted two input keys - Say "A" and "B". One of these is the correct answer for a trial and would trigger a correct feedback trial - the other an incorrect feedback. However, Pressing either key should terminate the trial (and trigger the relevant feedback). This currently works such that if you press the correct answer it triggers the correct feedback. However, pressing any other key triggers an incorrect feedback (which would be the right thing to do) but allows scope for errors to be made (such as accidently pressing the wrong key). This is what I'm trying to avoid. I suppose it may be easier to outline exactly what I'm trying to do. No other keys end the event. In SuperLab 4, the Mouse or Touch Screen input already contains an option to "Ignore a mouse click unless it falls inside an area defined as a response". I have just opened a case in our internal tracking system to implement a similar option for keyboard input.